Iulia Benze on her final day presenting a course on Identity Deconstruction at a festival in Hungary. We started the Sunday with a session of Yoga outside, in nature, held by E. and S.
Two new people joined us, Anjan and Andy. Anjan was really worried for her, he asked me if I could help her as she was constantly crying and being depressed. Our entire session (the last one for that series in Cserhatszentivan) changed, trying to include her into the warm-up and Barba sticks. Her will to get into the workshop was very weak, other members tried to include her as well. I instructed her into the Barba Sticks movements, even though she was lacking concentration and it felt she wasn’t there. At a certain moment, in our struggle to connect with her, she hit the lamp smashing it into loads of glass pieces and that seems to have represented for her the relief point and liberation time that she needed. After that, she decided to leave. Anjan remained with us. We ended our last session with Grotowski movements turning it into an improv free dance contact where we all kept contact with each other until we found an ending on the floor, all silent, still and breathing together. We also had a few minutes of meditation and after that the final discussions. As a human and artist, I am extremely grateful for this opportunity created to go in Hungary, Cserhatszentivan and facilitate workshops in my own practice. I met wonderful people, professionals in their own domains, and we all laughed and cried together and I was able to share from my knowledge. I am mostly a performer, I never facilitated a workshop by myself before; this time I was oscillating between being a performer and a facilitator and many times I was asking myself if it is going to work, because of the intense nature of the practice. Towards my amazement, it did work, I did manage to keep those entities separated and to make them harmoniously function together, bringing a lot of discipline to me, as an artist and individual. In this new position, I also learnt how to take care of people around me, how to listen and understand their needs. It was a wonderful experience for everyone and now we are working together towards booking future workshops in Budapest, in November this year. We started by cleaning the space and including the new people into the work. We had A. and V. After the warm-up, V. retired thanking us and saying this is ‘not really his thing’. We continued with Barba Sticks and emotions. Everybody brought their level of emotion to a certain place, E. let go and with control she managed to reach that point that I was talking about. Taking advantage of the emotional and physical flexibility achieved, next exercise was Loneliness Exercise. I performed in front of them the exercise, taught the movements and then for 10 minutes it was their time to explore the loneliness within themselves. Being in a small space has its advantages, also when 9 people are doing Loneliness exercise in that cramped space it can be very intense and intimate so after that we had a session of discussions about what we discovered, felt etc. Circle of positive energy. Everybody complimented, positively argued and justified being in a circle and hugged. After break, we explored ways to climb a person by one or two individuals, preparatory movements for a Photo Project (photographer Roland Kajcsa) that is still in process of editing. A few photos are available already on Facebook. Following day we had the same people coming plus new ones. We were 13 in total. We worked outside in the garden (open space-turned out to be a bit different from the previous day), as we were more people and we couldn’t all fit in the room. Our meeting started from 10am and finished at 3 pm. Introduction of new members, speaking about likes and dislikes. We talked about identity and I filmed them while they were answering the question What is Identity for you? After warm-up (rotations, spine, push-ups, plank etc), it was time for a new exercise, which was the Slaps. We created a big circle in the garden and we all counted together, as loud as possible, 500 slaps. The levels of concentration and dedication to this type of task differed from one participant to another, which made me launch for them questions about identity in relation to endurance and discipline. Still outside, we continued with Barba sticks and while I was introducing new people to the principles of this exercise, because of the lack of space, the one day old participants were allowed to tackle this exercise in a different room of the house by themselves, relying on their own discipline, assuming responsibility and taking risks without being supervised. At my suggestion but also listening to their intuition and spirit of exploration, they started alternating hands and vocalizing when playing this. As they admitted as well, it is a different type of experiencing the Barba sticks and the unknown/risk, implicitly fear, increases when the facilitator is not there. At this stage, the inevitable happened and one of our participants, B, in doing the task with A, got slightly hit in the head, shocking her system and making her feelings and frustration explode. She kept hiding, swallowing her anger, and I continued the game with her to help her letting all out. Everybody stopped and watched, witnessing in amazement the next level they needed to reach with Barba sticks. After that, we all made a circle in the sunny garden as it was time and we needed to talk. Everybody shared their opinions about Barba sticks, everybody had new discoveries and this time subjects like pain, hit, being hit were talked about. We were happy for the new that just opened and we decided to go inside to continue with Grotowski movements in which everybody was extremely connected to each other and taking care of their partners. Taking advantage of the heat in our bodies, flexibility was pushed to its limits through exercises and then we cooled down through a massage and care in pairs, opening new levels of excitement, enthusiasm for the next day of workshop to come. 2nd of July: 8 participants. We worked in a very small room, in an old house and I had to adapt the exercises of Identity Deconstruction for that old living room (it was an old traditional living room), with lamp hanging down from the middle of the ceiling. We started with everyone introducing themselves and talking about any injuries as well, as a mean of preparing them for what it will come and assuming responsibility. It followed up by a warm-up session and a game throwing a shoe to each other and calling our colleagues by name in the same time. We continued with Barba Sticks, everybody was extremely careful with each other but in the same time enjoying the task very much. I went with all the participants through the instruction of this exercise. I allocated a longer training into this to D., who later on told me he was autistic and how much this experience helped him so much. After working with discipline and staccato movements, I wanted to relax the atmosphere with fluid dance like movements through Grotowski movements which turned into trans improv contact dance and I was very pleased to see that from our first session participants weren’t shy to interact/touch while flowing in the space. That created a beautiful balance with what we did earlier. Going in the same direction, we also tackled the exercise of Positive Energy Cycle (positive argue-justify) and it revealed a lot of aspects to some participants. We ended our four hour session with meditation and discussions regarding what we did, felt or learnt. In the end, we managed very well to work and fill the space, the room gave us a certain intimacy, in fact it forced every one of us to continue moving and to enjoy the proximity of our partners, and it facilitated some really intense and high perspiration level sessions, leaving participants wanting and asking for more hours in the session per day. Some of them told me that our first session of Alternative Series of Workshops just made them change their mind about going back home from the festival, which was predominantly based on concerts, as they weren’t enjoying it very much because of the lack of theatre experiences. So I was very pleased to see that, as an artist, first time facilitating these workshops by myself, I managed to offer to participants some fulfilling experiences that made them change their minds about leaving and also spread the word about the intense work we are doing; at the end of the festival, many people approached me intrigued about what we were doing, asking information, some of them giving it go, some of them not, some just coming with outside personal issues thinking that they can be resolved with a session of workshops. Little they knew though that this requires a longer process! In March 2015 RtR sponsored George to facilitate a series of workshops across Romania … here’s a report from his experience in Cluj. We had spent a week designing and playing forums around ideas of freedom of expression. Through improvisation, we had explored the struggle of student workers and autonomist squatters in Cluj attempting to establish independent and non-hierarchical spaces. We had re-enacted riots, occupations, battled cops and capitalists and defended the rights of homosexual couples to express themselves intimately and publically. We had explored the oppressions of religion, of self-doubt, of the cops in our heads, attempting to find solutions to set ourselves and our companions free. On International Theatre Day – a year and a day since students occupied Cluj University for two weeks of forum and self-actualisation – our little group of theatre artists hit the streets, unsure of what exactly might happen, but determined and prepared to find out. We played with invisible balls in the park, passing them to passerbys to returned them with a laugh. We rediscovered benches, lamp-posts and bins, converting them into make-shift percussion.We chased after each other for the sheer thrill of the chase. Later, in the streets of Cluj, we staged an attempted bike theft from one of our own, and were shocked by the bold and indignant intervention of local street traders, who berated the ‘thief’ and chided the ‘owner’ for being so confident in leaving her bike unlocked. We provoked, and our actor afterwards was concerned that everyone in town would think him a thief. We talked as a group and decided, better to let them think it was real than be the boy who cried ‘wolf’. We had wanted to incite a response and had succeeded. In the late afternoon, we wandered over to the National Theatre, where they were having an open day. In the grand interior we sat, mute and appalled, as some bespectacled elitists asked and answered their own questions on the relationship of theatre and society. Alienated by their monologue, we slipped out into the street and growing rain. 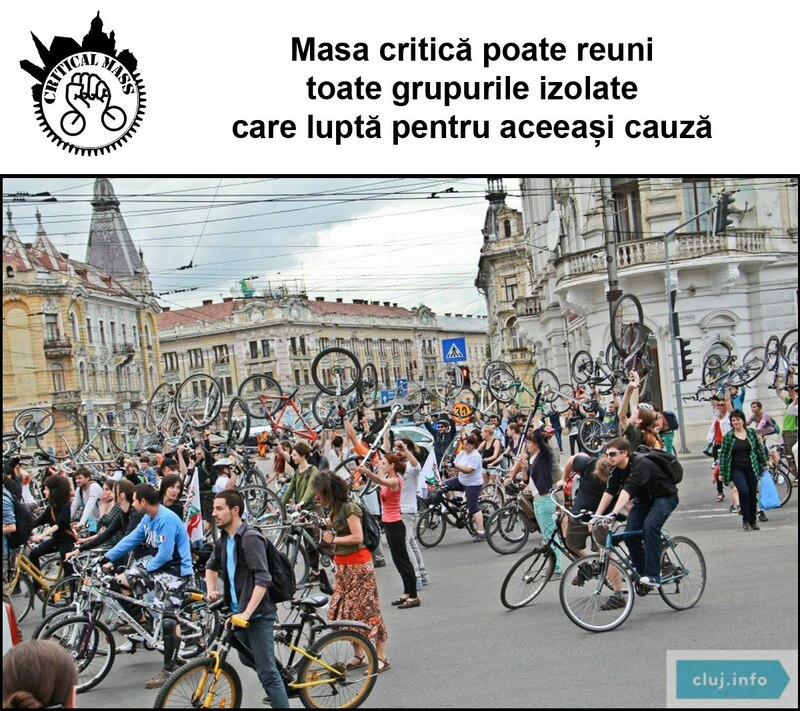 That night, 300 cyclists gathered in the Piata Uneri for the monthly Critical Mass. A horde of wheeled barbarians wheeled around the city, blocking traffic, taunting the police, sounding horns and chanting ‘bi-ci-cleta!’ as they reclaimed the roads. People smiled, waved from windows, realised their mistake as they tried to push through a crowd of militant cyclists with their car. A group of anarcha-feminists buzzed the abortion clinic where pro-lifers were holding a 40 Day Protest ‘For Life’ with screams of ‘my body, my choice. Bikers blockaded roads to allow the mass to pass, and at the climax rallied back at the Piata to decry the corruption of the Romanian government with hundreds of other protesters.